The Santa Cruz Lumber Co. today took possession of it's new WISCO three-drum yarder (new at least, to the SCLCo). 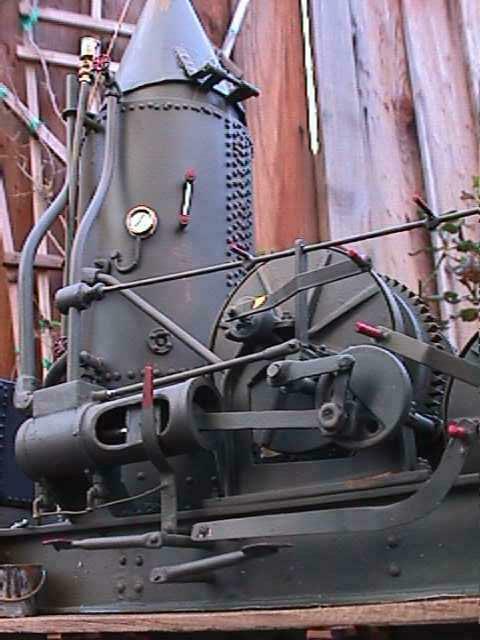 The yarder was purchased from the Honest Charlie's Used Donkey Engines of Springville, Alabama. 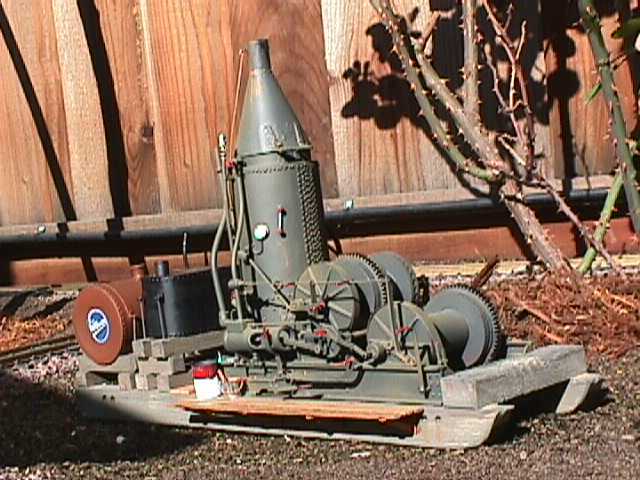 She was scratch built in their own shops by Charlie Watford, their master mechanic, and arrived in impeccable, if somewhat weathered, condition. 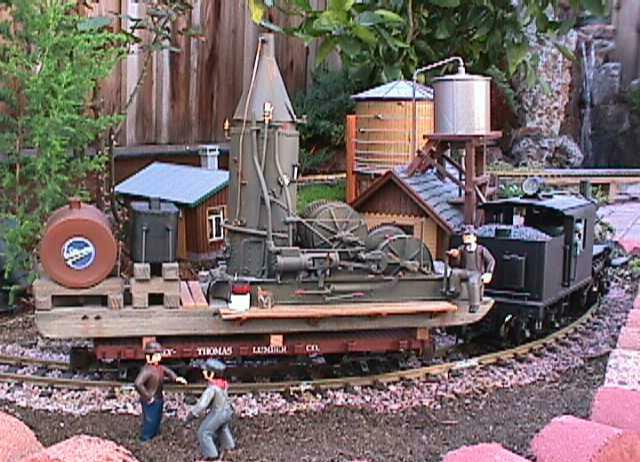 There was much excitement around the water tank as the yarder was loaded onto a flat car (formerly of the Ely Thomas Lumber Co.), for transport to the falling area, where it will be used to drag the logs into the loading area and hoist them onto log cars. Here we see the yarder, loaded on the ex-ETLCo flat, and almost ready for her trip to her new home. Slingin' Sam receives instructions from the Super about final placement. With the hangover he currently has, all Sam wants to do is get this over with! Besides that, he hurt his back during the loading, and takes the opportunity to complain loudly to the Super! He does seem to be exhibiting a noticable stoop. Some days, it just don't pay to get outta bed! Everything's ready to go except that the yarder overhangs the ends of the car to such an extent that No. 1 can't couple to it. A man was sent to the storage house to bring back a rooster, and still hasn't returned, so folks are getting impatient! Sam is still griping - once he starts, he's hard to shut up sometimes! Sitting atop the yarder is Benson Ennis, Master Mechanic of the SCLCoRR. He's along to make sure all goes well. A closeup of Honest Charlie's exquisite workmanship! Finally on the ground near the falling area, the yarder will winch itself to it's final location. 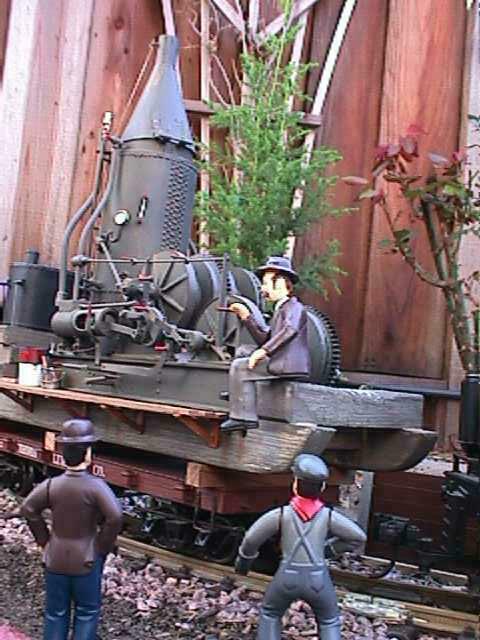 Since the area hasn't been lumbered yet, much work remains to be done in topping, debranching, and rigging a couple of spar trees, and getting everything set up, as well as extending the tracks into the area. The SCLCo hopes to have the work done in time to start regular logging season as usual. 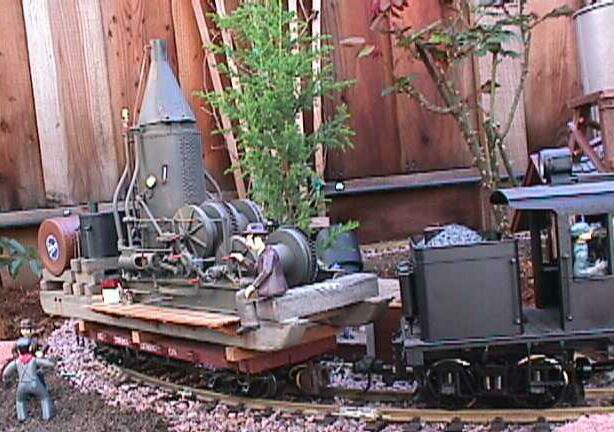 BTW, the yarder is one of Charlie Watford's fabulous scratch-built creations! Great job, Charlie!! I couldn't be happier! !